The Milwaukee County Zoo is now home to two, 9-year-old, female cheetahs acquired from the Wildlife Safari in Winston, Oregon. Although unrelated, the cheetahs get along quite nicely and are often seen in very close proximity to one another in their outdoor exhibit. Imara weighs in at 90 pounds, while Kira tops the scale at 100 pounds. Imara appears to have a friendlier, more “talkative” personality – vocalizing frequently with chirps and other interesting cheetah sounds – while Kira is a little more aggressive and likes to assert her authority. Kira also appears to be the adventurer of the pair. Each cheetah is fed just over 3 pounds of Nebraska Premium Beef daily. Treats include chicken and pork. Native to Africa and Iran, cheetahs are an endangered species since their numbers are dwindling in the wild. 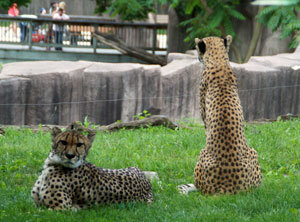 The Milwaukee County Zoo provides financial support to Cheetah Conservation Botswana. Through our local AAZK chapter (American Association of Zookeepers), we also provide support to Action For Cheetahs In Kenya. Visit Imara and Kira daily in the Florence Mila Borchert Big Cat Country, outdoor Cheetah Exhibit. Cheetahs are the fastest land animal and can reach running speeds of 60 miles per hour in just three seconds!